Going on a Field Trip | What Next? I went on a field trip last week with a group of women from my church. 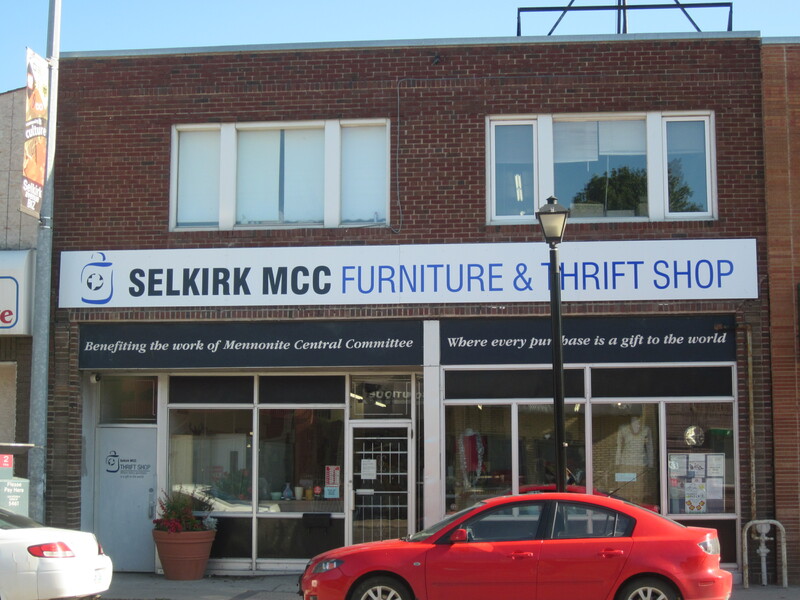 We all volunteer at the Selkirk MCC Thrift Store together. Marj is our leader. Her weekly news reports via e-mail keep us in touch with each other. That way even if we miss a week of volunteering we still know what’s going on with the others in our group. In one of her newsletters Marj proposed a field trip. We all agreed it was a great idea. So last Wednesday we headed off on our little adventure. Next we dropped in at the Altona Thrift Shop. 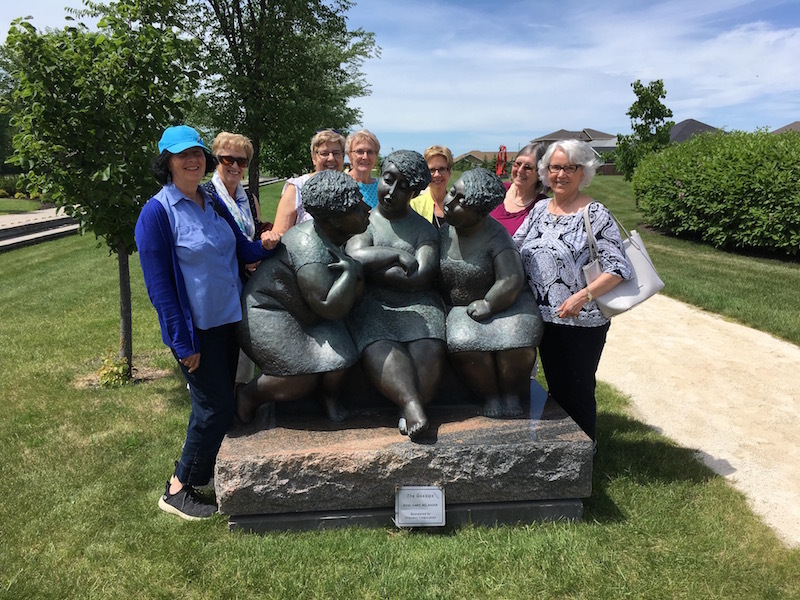 It is of historical significance because it was the first MCC Thrift Shop in North America and was founded by four energetic and philanthropic women from Altona. Altona residents Selma Loewen, Sara Stoesz, Susan Giesbrecht, and Linie Friesen started the first Thrift Shop in 1972 to raise funds for MCC’s work in developing countries. The store staff was ever so nice to us and gave us a tour of their facilities. We marveled at the beautiful quilt room where material is saved and cut and sewn and stitched by many groups of volunteers. Then the quilts are displayed and sold. On the way home we made a stop in Neubergthal, a Canadian historic site where homes and other buildings, are maintained as they might have been in a traditional Mennonite village. 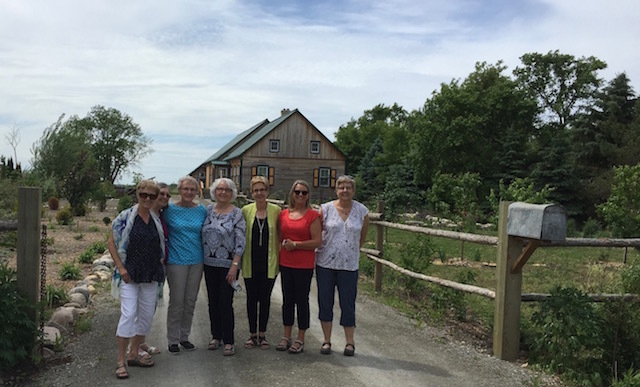 Here we pose on the driveway of a home that belongs to fellow members at Bethel Mennonite Church. After our Neubergthal stop we headed back to Winnipeg and said good-bye, but not for long since we will meet again next week on the second storey of the Selkirk Thrift Shop where once again we will be unpacking, organizing, cleaning, and pricing donated items. Of course we will also be chatting about our memorable field trip.